is created by stylists for stylists, offering a touch of affordable luxury and unmistakable panache. For the first time, bioengineering has allowed Evolutionproof to use Fibroblast in a professional hair product. Fibroblast is a binding molecule that allows cellular proliferation and has the power to drastically repair and increase cell regeneration. For years, Fibroblast has been used in the medical field to aid in the healing of wounds and repairing skin on a cellular level. Through bioengineering, Evolutionproof has formulated a way to use this same ingredient to rejuvenate your hair. 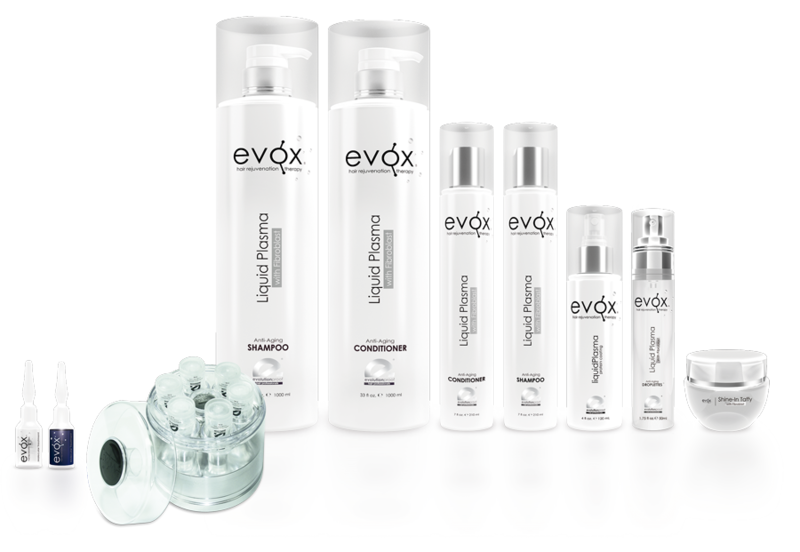 Evox® ’s Molecular Treatment consists of micro-molecules made up of dormant cells that once activated, become biologically active and are specifically formulated to help rejuvenate, repair and regenerate natural protein fibers within the inner layers of the hair. has the power to drastically repair and increase cell regeneration. Liquid Plasma increases the ability of hair to retain moisture and extensively reconstructs and reinforces the cuticle scales that protect the inner layers, making them 3 times as strong.